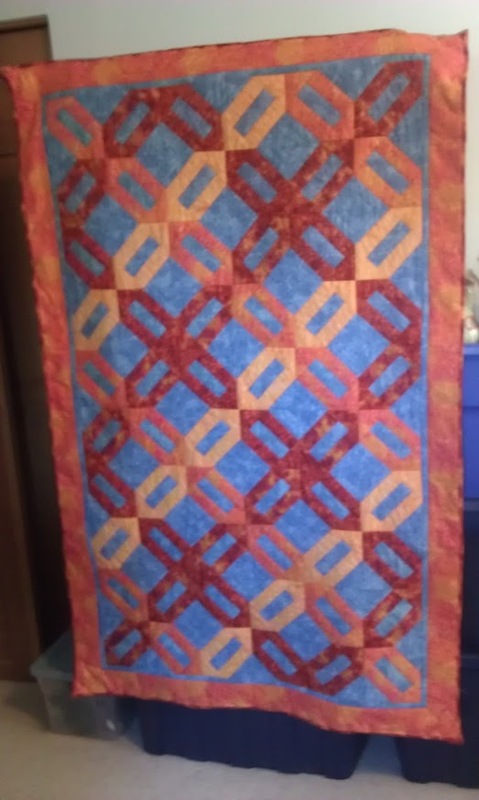 A while back you may remember I bought a bunch of orange fabric and made some friends a Cracker Quilt. Well because I am kind of new to the whole thing and worried about things like running out of fabric or butchering my fabric in some fit of miscutting… I overplan in the fabric department. 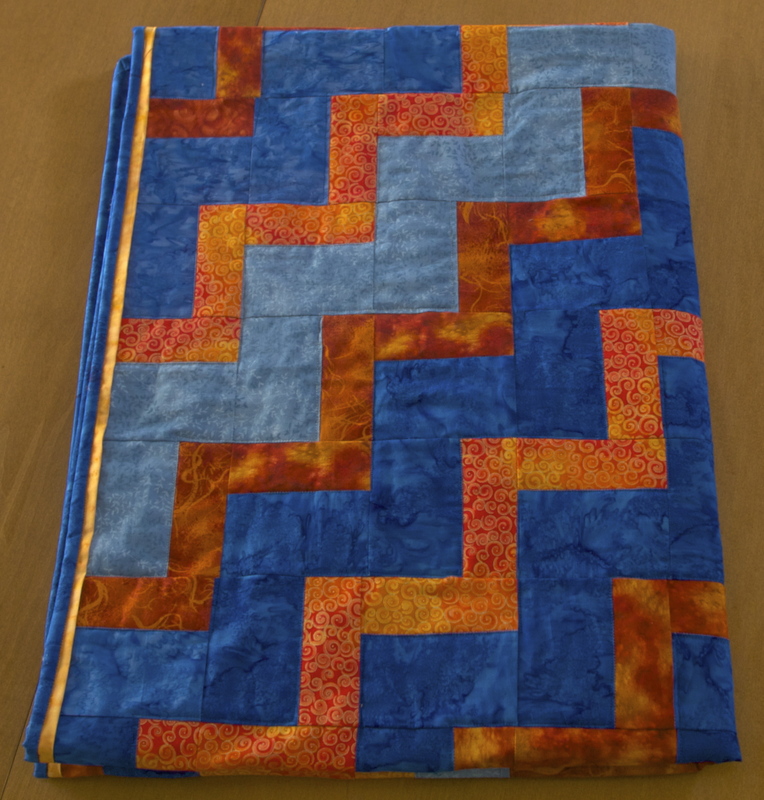 So for my fourth quilt I didn’t actually have to buy any new fabric at all! I wanted something that would look like a companion piece to the cracker quilt… so I settled on a pattern called Endless Stairs. Front… with all the stairs! For the Back… I wanted to do something a bit different. 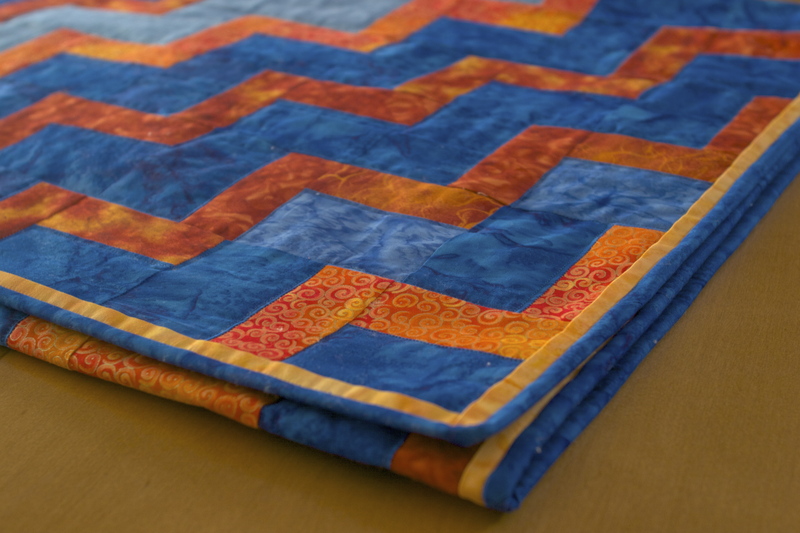 I have been admiring some of the newer quilt designs where the quilter pulls in the design elements or embellishes the backside in a complementary way. I went with a framed chevron pattern. I am a believer in trying new things. They won’t always be a success… but not every failing is a failure. For the back piece… I pieced my orange and blue middle stripe first and then realized I hadn’t sewn in the blue triangles between the points. WHOOPS! I did actually manage to pull off piecing those triangles in there.. but it was a lesson in not getting too focused in and to take your time making sure you’ve seen the whole bigger picture. Here’s an extra detail shot, especially since Ben got the new cards for the nice camera! And btw… I still have quite a bit of orange left! The dark orange is actually a combination of 3 different fabrics.